The Beatles had recorded George Harrison's If I Needed Someone in October 1965. On this day they recorded another of his compositions, Think For Yourself, under the working title Won't Be There With You. The session was a late one, beginning at 9pm and finishing at 3am the following morning. The Beatles began by rehearsing the song, a process which was recorded by George Martin in the hope of some of the material being usable for their Christmas fan club release. The recording was labelled Beatle Speech, and the tape box was labelled with the words "This will eventually be issued". None of it was used on the Christmas flexi disc, but a snippet of the group practising their vocal harmonies was used in the Yellow Submarine film in 1968. The basic track for Think For Yourself was recorded in a single take, with bass guitar, drums, Harrison's Fender Stratocaster, and John Lennon's Vox Continental organ. The Beatles then recorded a number of overdubs, including a three-part vocal track led by Harrison. A second track was also filled with three-part harmonies, plus tambourine and maracas. Perhaps the most notable addition to the song, however, was a second bass guitar part played by Paul McCartney, fed through a distortion unit. 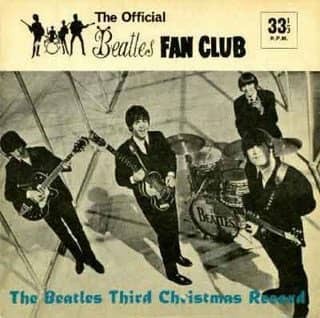 Late into the night, once work on the song had concluded, The Beatles recorded The Beatles' Third Christmas Record. Three takes, all largely ad-libbed, were recorded, and edited for release by George Martin the following day. For me the “Beatle Speech” was recorded during the session, rather then before that, because John, Paul & George are overdubbing the harmonies & only the “And you’ve got time to rectify all the things that you should” line had to be harmonised. As we hear on the tape that line took at least 15 minutes. The backing track was already done, as we hear a playback for John, Paul & George for where to come in with the line. Then tape is cut off just before George is going to do a double-tracked vocal. Thanks for sharing the links, Julian. Great stuff!